Best-Quality Green Screen Kit at Affordable Prices. Being in the modeling industry, I am often required to play with images and videos to make them look fresh and new. 123VideoMagic does all that and more. I was able to transform my dull images to really lit up pictures by using amazing backgrounds provided with the application! Everything you Need for Green Screen Photography, Now at Affordable Rates! 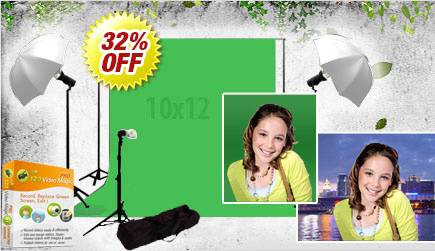 The Chromakey Green Screen Kits offered by 123 Video Magic includes everything you need for green screen photography. The hardware kits are ideal for both professional and amateur photographers. All the photography equipments and accessories included in the portable Green Screen Kit are of premium quality and available at pocket-friendly rates.